What looks like the opening scene to every other Italo-Western is, in fact, the opening scene to your very own Italo-Western called Bang!. Italo-Western is an especially apt description here because not only is that the movie genre Bang! emulates, the creator Emiliano Sciarra is Italian as well. Bang! is a card game for four to seven players, a niche that traditionally has few games filling it, and it’s definitely more fun at the upper end of that range. It’s a Wild West shoot-out with hidden team memberships: the Law on the one side, the Outlaws on the other and the Renegade somewhere between them, laughing gleefully at the ensuing carnage. 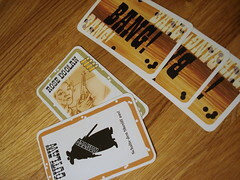 To determine which side you’re on, the first card you receive at the beginning of the game is your role card: One Sheriff, one Renegade and varying numbers of Outlaws and Deputies depending on the number of players. The Sheriff is the only player who reveals his role – the star on his chest is a big give-away, after all – everyone else remains unknown for now. The Sheriff does not even know his own Deputies – hence his just arriving in town. Next you will have to choose your character from the two options you are dealt. Your character card determines two things: your special ability and your life total – well, also your name, but that doesn’t have any effects on the game. The special ability is unique to each character and covers a wide variety of effects: drawing additional cards in certain situations, emulating the effect of equipment cards, having a greater distance to other players (more on that in approximately two paragraphs) and many more. The power of these special abilities is not perfectly balanced; some just are more powerful than others. To counter that, the characters with less powerful abilities have four points of health while the more powerful ones get only three. When you choose your character, instead of discarding the other one you use its backside to display your health: there is 5 bullets there, you just slide up and down your character card to reveal your remaining health there. Each players turn is a fairly simple affair: each turn, you draw two cards, play as many of them as you want and discard at the end of your turn until you have no more cards than your current health. Playing cards is the only thing you really do in Bang! – but that doesn’t make it lack variety in any way, the effects of the cards make sure of that. There is two general kinds of cards: equipment cards, with a blue border, and action cards, with a brownish border. Equipment cards, when played, stay in front of you – and only you, no making gifts – and have an effect until someone steals or destroys them, so usually until just after your turn is over. There is most anything you could want in a western, starting with horses and weapons. Horses either increases the distance from other players to you or decrease the distance from you to them – yes, distance in Bang! is not necessarily the same depending on which direction you are looking from. This is not geometry lessons, so don’t worry about that little detail – except of course when someone is shooting at you but is too far away from you to shoot back. Then you should worry. Most weapons increase the range at which you can shoot people. You can only have one horse at a time – obviously, and some of you may be disappointed to hear that you can only have one weapon, too. 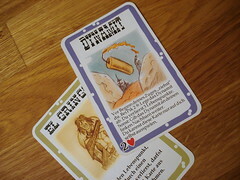 Other equipment cards include a barrel to hide behind and a stick of dynamite to toss around – the wild west version of russian roulette. Now is probably a good time to get into the concept of distance in Bang!. Distance is based on the seating order around the table: the person directly to your left and right is at distance 1 from you. They are in the unfortunate situation of always being in range for you to shoot. The people past them are at distance 2 and so on. Unless you have some equipment they are safe from you – at least until you kill someone, because when a player is eliminated, he’s not considered for the distance calculation any more. So no matter how many people die, this town will always be to small for all of them. Distance is important for many of the action cards – most importantly the Bang! card. Playing a Bang! card does not hold any big surprises: you shoot someone. Your target will lose one point of health unless they are protected by their special ability or equipment or they play a Miss, one of the few action cards you can play out of turn. 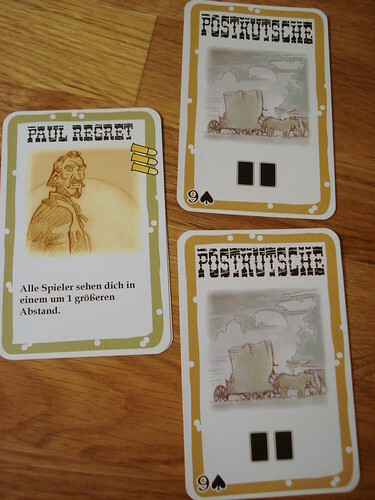 Of course, if shooting people was the only way to rid yourself of the other players, this would be a very boring western. So to spice things up, you can also bribe a local Indian tribe to attack, challenge someone to a Duel or simply super-size a Bang! card and play a Gatling. Some of these cards hit everyone around the table. They also ignore the distance rules and are not limited to only playing one of them per turn like Bang! cards are. And since killing people is not everything – after all, sometimes you need to stop shooting and go find a bigger gun – not all action cards revolve around spilling blood. You can also steal or destroy equipment, find various ways to find more cards or simply hang out at the saloon for a beer, with the convenient side effect of gaining back a point of health. Still, the ultimate goal in most westerns is to be the last one standing in a big circle of corpses, and Bang! is not an exception. Sooner or later people will die. When that happens, the newly-made corpse is eliminated from the game and his role is revealed. If he was an Outlaw, his killer may now go collect the bounty: three cards from the draw pile. If it turns out the victim was a Deputy and the killer turns out to be the Sheriff himself, he’s in for a round of punishment: he loses all his equipment and hand cards, but he does get to keep his badge – no one wants to wait around for a month or two until the new Sheriff shows up, after all. Being eliminated from the game is not the end. Well, it is, but it doesn’t mean you can’t win. Even if no one knows who their team members are, Bang! is still a team game, and if your team manages to win after your demise, you’re still counted as a winner. Don’t expect anyone to invite you to the victory party at this point. 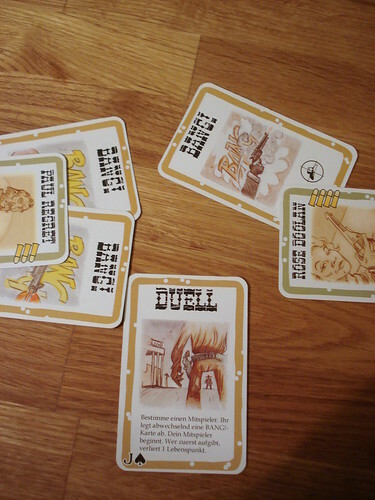 When all Outlaws and the Renegade are eliminated, the game ends with a victory for the Sheriff and his Deputies. The game also ends when the Sheriff dies. At this point the Renegade wins if he is the last one alive, otherwise the Outlaws win. This can lead to the somewhat paradoxical situation that the Outlaws win even after they all died, in case the Renegade shoots the Sheriff before his Deputies – but that really is his own fault then, he can’t claim he didn’t know who the Sheriff was. Summing up Bang!, lets start with the downside: Bang! is a game with player elimination, and someone might be out of the game even before they take their first turn and then wait for 30 minutes or more before the others finish. That person will hardly consider it a good time. Being unlucky with cards and sitting for multiple turns without anything to do is also a problem sometimes. On the other hand, Bang! is a game you can explain and get into quickly with more people than most games support. While it does involve a lot of luck, there is still a surprising amount of strategy involved, and your role, character, starting hand and position at the table will force you to reconsider what to do in every game. As a Sheriff, you will be passive in the beginning of most games lest you accidentally kill your anonymous Deputies. But sometimes, with the right starting hand, why not shoot everyone to within an inch of their lives and let your Deputies finish them off. As an Outlaw, opening fire on the Sheriff right away can be a good strategy – but so can leaving him alone pretending to be a Deputy. Remember that killing your fellow Outlaws pays the bounty to you as well, and if you can fool the Sheriff into shooting his Deputy, that’s bonus points for you. As the Renegade, you have a slightly harder job than everyone else: your all alone against everyone else, so you have to play both sides and hope they mistake you for an ally, and in the end you still need to kill the Sheriff, who had time to prepare and more health than everyone else to boot. But while being the Renegade is tough, it’s nowhere near impossible to win. Despite all the killing going on, Bang! is a light-hearted, parodic game. The over-the-top amount of lead in the air and the beautifully cartoonish illustrations make sure that you don’t mistake it for anything else. Bang! also brings out the role-player even in people that are not into RPGs, and it’s almost mandatory for someone to say things along the lines of “This table is too small for both of us” or “I’d kill you for a handful of cards” or – always popular – break into a song of “I shot the Sheriff”. Bang! is a tense game of strategy, hidden identities and luck, but above all it’s a game about having a good time. It doesn’t matter so much who wins in the end, as long as the showdown at the Meeple Coral was exciting. Of course there is a risk of leaving the game early that might put you off. But if you can put up with that and regularly get together with five or six other people – because playing with more people is much more fun in Bang! – oh boy, that came out wrong – Bang! is an extremely fun pass-time that you can take anywhere and is suitable for almost any group of people who are at all interested in games. And if Bang! gets boring at some point after all, there is a bunch of expansions out: Dodge City is more of the same, but harder and with more options, also increasing the number of players to eight; High Noon and A Fistful of Cards add changing special rules on every round, making cards more powerful or utterly useless or even bringing people back from the dead for one round, alleviating the elimination problem a bit. And if they all sounds like fun, Bang! The Bullet! packages the whole shebang in an oversized bullet-shaped package that will probably never give you any trouble when boarding a plane. Bart Cassidy stood up from behind his barrel and dusted off his dark coat. Fort Meeple’s Main Street was littered with bodies, but Bart was sure there was no one left who wanted to do him harm. His spores clinked as he walked over to the saloon where his donkey was tied, miraculously unharmed by hail of lead that had filled the air until moments ago. Bart untied him, mounted up and set out towards the sunset. Turns out there was not a single person in Fort Meeple that needed the protection of the law to start with – and now there was not a single person in Fort Meeple at all. Time to move on. City building games don’t have to be big and complex, Machi Koro proves that. All you need to build your city are two dice, some cards and about half an hour of time. You couldn’t take anything away from this game and still call what is left a game. But even being that light, Machi Koro is published and popular in more countries than most games ever see. Not every that has merchants as a theme need to be a complex trading game. On the contrary, Oltre Mare is a light game where you don’t worry about the price development of olive oil but instead need to think about the best use of your cards.